Through the vast waters of the Pacific Ocean gigs here and there an island or archipelago. These include also French Polynesia, called Tahiti, which is real paradise on earth and a great destination that should be visited by everyone on the Earth. The blue lagoons, coconut palms, half-naked natives dancing around the fire – at least this is how I imagine this area. French Polynesia is located in the eastern Pacific Ocean. Total area includes ​​118 islands and atolls barely reaches 4000 square kilometres. French Polynesia is not located in Europe, but it belongs to a European state – France, as its overseas country, so I thought it could be listed here. With the 44 km2 belongs to the larger islands of the Society Islands group. It was discovered in 1722 by the Dutch explorer Jacob Roggeveen. However the first explorers, led by James Cook, landed here in 1777. 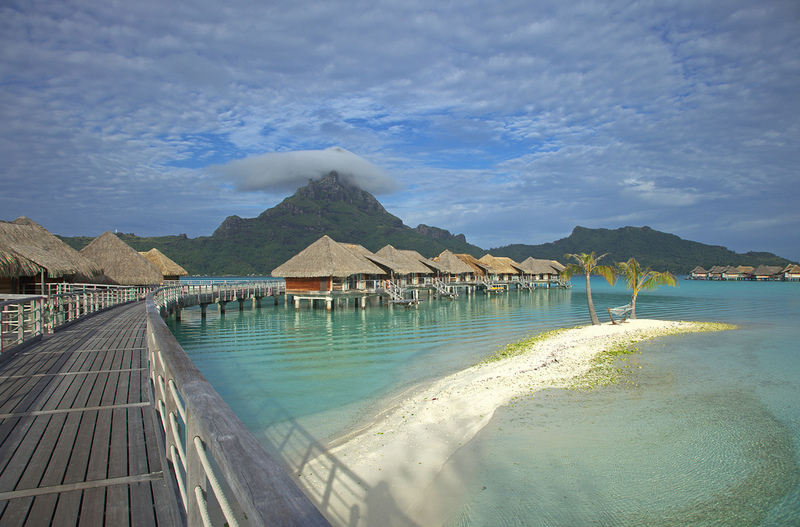 Bora Bora has been together with other islands of French Polynesia – despite a relatively high degree of autonomy – overseas territory of France since 1842. Local residents are therefore citizens of the French Republic. During the World War II there was a U.S. military base, as is still visible not only at the local airport, but also in different places of the island where you can see seven old long-range cannons. Today are among the favorite tourist destinations. The rocky island however offers more interesting places. It consists of two dominant peaks of extinct volcanoes Mount Pahia and Mount Otemanu, of which the greater Mt. Otemanu, rises to a height of 727 meters above sea level. You can climb to both of them, but it is recommended to do it with a local guide. The climbing to each of the peaks is quite demanding and takes about 2 hours, but the panoramic view is worth it. Tourists can also visit marae, ruins of stone buildings where people before turning to Christianity took place of social and religious rituals. Marae are still sacred and no one would dare to build on their sites.